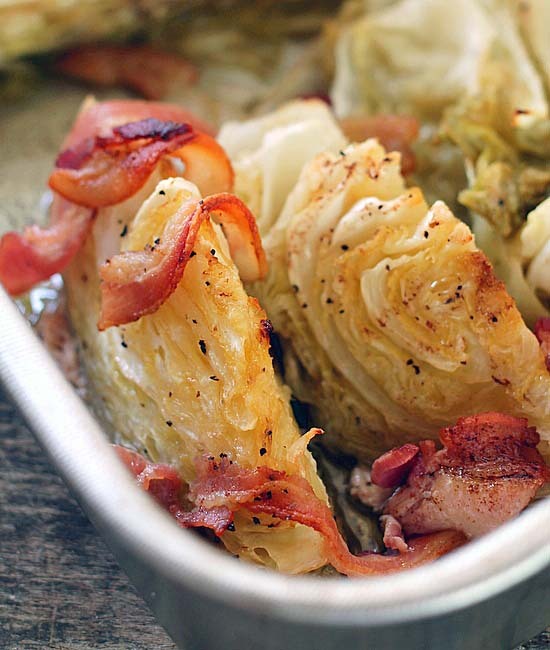 Baked Cabbage- The bacon adds flavor while the browned butter adds it’s own unique taste. It’s absolutely delicious! This is a Baked Cabbage recipe you are going to LOVE. Last summer we had a party on Gilberts Creek and one of our friends made a whole baked cabbage head. She cored the cabbage and took a slice off of the bottom of it to make it sit upright. She filled the hole in the cabbage with butter, seasoned it with salt and pepper, wrapped it in foil and baked it. Because it was a whole head of cabbage and not cut into wedges it took well over two hours (more like 3) to bake through. Paul loved the baked cabbage and wanted me to make it yesterday. It was 92 degrees here, just the thought of the oven being on for 3 hours without the air conditioning in yet was enough to send me into a hot flash. After looking at many Baked Cabbage recipes I decided to use one from The Kitchn that I slightly modified. I set the oven to 450 degrees. The reason Paul loved the whole baked cabbage head recipe from last summer was because of the butter. He loved the soft, baked cabbage and butter mixed together. I melted a 1/4 cup of butter and let it brown. Browned butter has a very unique flavor that is delicious! You have to be careful when cooking it though, it can quickly go from browned to burnt. I drizzled the browned butter over the cabbage. I placed foil over the baking pan for the first 30 minutes of cooking and took the foil off for the last 30 minutes or so until the cabbage was getting golden brown and tender. OH YES! The bacon adds flavor while the browned butter adds it’s own unique taste. It was absolutely delicious! This is a Baked Cabbage recipe you are absolutely going to LOVE. Enjoy! Looking for more great vegetable recipes you can use from your garden, try these! The bacon adds flavor while the browned butter adds it's own unique taste. It's absolutely delicious! This is a baked cabbage recipe your whole family will love. Cut the cabbage head in half. Cut each half again, making four wedges. Cut each of the 4 wedges to make a total of 8 wedges. Cut the core from each wedge on an angle. Place the wedges in a roasting pan. Salt and pepper the wedges, drizzle with a little bit of olive oil and lay the bacon pieces on the wedges. Using a small saucepan over low heat, melt 1/4 cup of butter. Cook and stir until the butter turns brown (being careful not to over cook, it will burn quickly). Drizzle over cabbage. Bake with the pan covered with foil for 30 minutes. Remove the foil, bake another 30 minutes or until cabbage is tender and starting to turn golden brown, serve immediately. Check out these delicious cabbage recipes from other bloggers. Tell Paul that baked cabbage is actually a bbq thing. It was popular on the competitive bbq circuit a few years back. No need to heat up the house. Chris now that’s a fantastic idea! Love it!! What did you put the cabbage in when you made it on the grill?? My hubby makes it on the grill.. We quarter it up and wrap in bacon salt and pepper wrap each quarter in foil and put on the grill till tender. 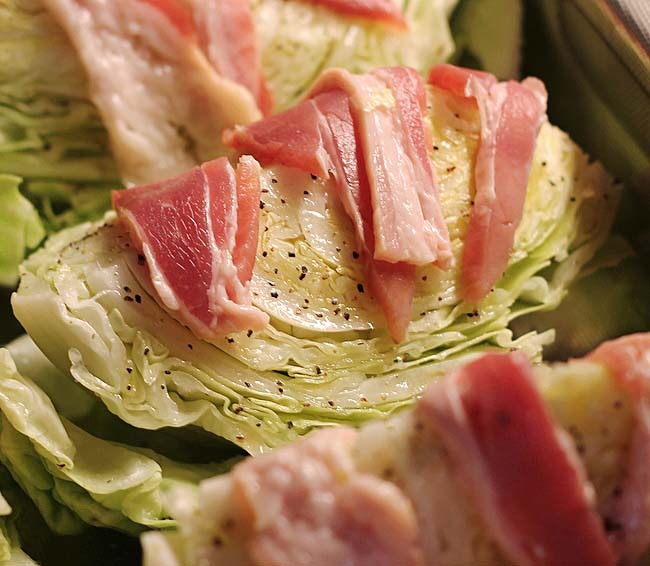 Do you know the exact recipe for the whole head baked cabbage? in the flavors seem to work so well together. Fantastic Judie, I didn’t even think about cooking it in the crock pot! It will not brown in a crock pot, nor will it have that “roasted” flavor. I have a turkey roaster that we use outdoors during the summer months when it’s just too hot to have the oven going indoors. I hooked up the roaster to a plug-in on our back deck and set it on one of those foldable tables, but a card table will work, too. Just so the cord can reach the plug. This turkey roaster has been a dream come true because I’ve made pies, cakes, roasts, casseroles, baked potatoes – – you name it, we’ve cooked it in there. Oh, and yeah, I even roast a turkey in it occasionally! Also, as an aside, do not use olive oil in the oven or with any heat at all. Olive oil is meant to be used as a salad dressing and not much more. It does not have a high smoke point so I would never cook with it. Actually, I don’t even bother to buy olive oil because it is usually rancid from the time I first open the bottle because even the more expensive bottles from the grocery store are cut with cheap oils (a money-making ploy, to be sure). We use either real butter made from pasture-fed cow milk (raw usually) or I use coconut oil – or a mixture of the two. I have also recently started using some stuff from Nutiva (a shortening-like product which is also classified as a superfood). It works well for lots of things, but real butter lends the best flavor to all dishes. Hope some of that info will be helpful to someone. Thank you D. Smith! I’m gonna have to get me a turkey roaster buddy!! Thank you so much Joan for coming back to tell me! You just made my day! Made it just as you suggested in the oven. But, since my husband doesn’t like. “Wiggly” bacon, when it was done I put the bacon under the broiler to crisp it up and broke pieces over it all. It was a hit! LOL! I totally get the wiggly bacon thing! Thank you for coming back to tell me you made it, you just made my day! I made this the first time according to the directions, and the browned butter turned totally black and burnt-tasting after all the high-heat roasting. The second time I made it, I waited to drizzle the browned butter over it after it came out of the oven, just before serving. It was delicious! That is the reason I only gave it 4 stars, because of the funky direction to add the browned butter before roasting. I’m glad it worked for you your way Kimberly. That’s all that matters. I didn’t have a problem with the butter burning when I made it. But like I said, if it works your way than that’s fantastic! Did you strain the solids out of the browned butter? If your using the crock pot would you add the browned butter on in the last hour? Robin, no I didn’t drain the solids. I’ve never made the cabbage in the crockpot before so I’ll be very interested in how it turned out for you. Yes I’d add the butter in the last hour. Let me know how it came out! Wow! I would never have thought to put bacon on cabbage! This looks and sounds amazing…maybe I could even get my daughters to eat cabbage this way! I’ve never thought of baking or roasting cabbage before. You have opened up lots of ideas for me now. This is now my favorite way to cook cabbage. Easy, fast, and delicious.I made this for a family dinner. Everyone loved it, even family that does not like cabbage. My family loves this recipe. 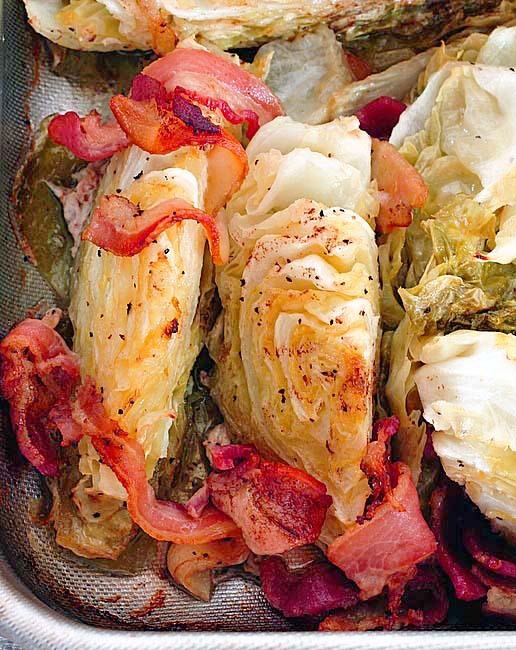 LOVE cabbage and bacon together! Haven’t had it in forever! Need to try this one. Looks perfect! This Baked Cabbage make the dish so delicious. Love the addition of Bacon in it. Cabbage will now be an add on to my family diet.